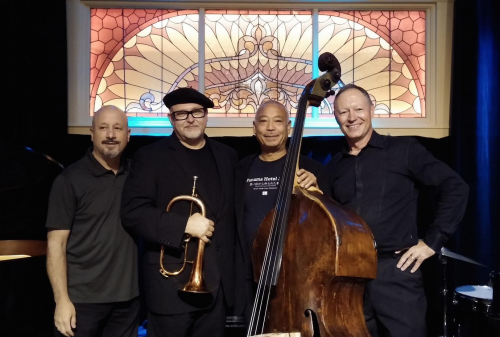 Winner of "NW Jazz Instrumentalist of the Year” honors in the recent Earshot Jazz Golden Ear awards, Dmitri Matheny and his band will play The Washington Center For The Performing Arts Black Box Jazz series on Friday, January 19, 2018. (L-R) Bill Anschell, Dmitri Matheny, Phil Sparks, Mark Ivester. Thank you for helping to make it happen. Looking ahead, the Dmitri Matheny Group is kicking off our 2018 concert season with a very special event—something we’ve never dared try before—an entire show of all-original music, at one of the most beloved venues in the Pacific Northwest. On Friday, January 19, please join Bill Anschell, Phil Sparks, Mark Ivester and me for “Black Box Jazz” at The Washington Center for the Performing Arts (Olympia). We’ve put together a lively, diverse program, highlighting favorite original works from our recordings, as well as some brand new sounds we think you’ll really enjoy. So please tell your friends, get your tickets, and make the scene! It’s gonna be a stone groove.